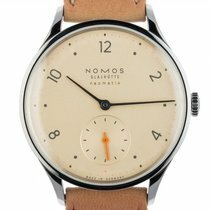 Classic NOMOS and yet entirely new: This watch has perfect proportions in a 35.5-millimeter diameter. Ink blue, red and a dash of gold contrast with the white silver-plated dial. Ticking within Minimatik is the new in-house automatic caliber DUW 3001. DUW stands for NOMOS Glashütte Deutsche Uhrenwerke and for the fact that the watchmaking company makes all its movements in-house in Glashütte.